BRAOU Eligibility Test 2019 for BA /BCom /BSc Degree admissions 2019, Last date for Registrations is 28-03-2019 Exam on April 28 : BRAOU Eligibility Test 2019 -Eligibility, Application, Dates : BRAOU Eligibility Test-2019 for Admission into UG Programs (B.A/B.Com/B.Sc) at Dr. BR Ambedkar Open University Dr. B.R. Ambedkar Open University (BRAOU) had issued the notification for Eligibility Test 2019 for admission into B.A. /B.Com/ B.Sc. for the academic year 2019-2020. 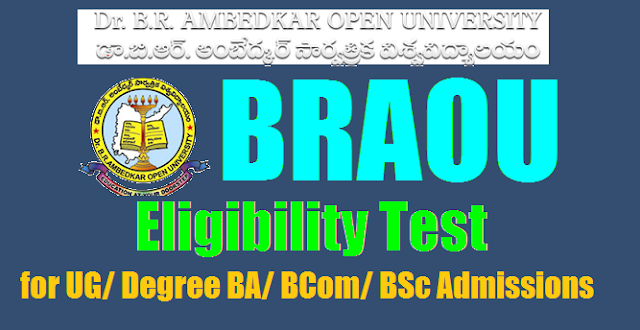 Ambedkar Open Degree admissions test 2019, Ambedkar Distance Degree admissions test 2019, BRAOU Degree Course Entrance Test, UG Courses Eligibility test, BRAOU Degree Eligibility Test Online application form, Last date for apply for ET, ET Exam date, Eligibility Test Hall tickets, Eligibility Test Results and more details avialable at braou web portal: AP TS BRAOU Eligibility Test 2019 for BA/BCom/BSc Degree admissions 2019 and Online applications through braouonline.in are invited for appearing the entrance test for join in Distance ba/bcom/bsc degree courses at its Study Centers. Test will be conducted in ENGLISH, TELUGU & URDU MEDIA at the Study Centres of Dr. B.R. Ambedkar Open University. Hall Tickets : Applicants should download Hall Tickets at least Two days before the Examination Date from the Website (www.braouonline.in) .Hall Ticket can also be collected in person one day before the Examination from examination Center chosen by them. The Candidates are requested not to make any cash payment at Dr. BRAOU Study Centres. 1. The Registration Fee must be paid through debit/credit card or any TS/ AP ONLINE FRANCHISE CENTRES ONLY; & (b) The candidates who already passed the Eligibility Test counducted by the University in 2014, 2015, 2016 and 2017 and could not take admission into the U.G Programmes so far, need not appear for the Eligibility Test -2019. 2. They can seek admission into 1st Year U.G. when Notification is given for Admissions in May/June-2019 tentatively along with the candidates who possess Intermediate or its Equivalent Qualifications. 3. Visit the University Website for the complete list of Study Centres, Information Brochure on ET-2019 and also Model ET Question Papers. a) Commencement of Registration: 24th January 2019.
b) Last Date for Registration : 28th March, 2019. April, 2019 10.00 A.M. to 12.30. P.M.